The Administrative Procedures Act, ACA 25-15-201 et. 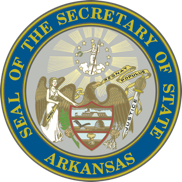 seq., requires state agencies, boards and commissions to file with the Secretary of State a copy of each rule adopted by the filing group. ACA 25-15-218 requires the Secretary of State to publish all state agency rule notices, emergency rules, adopted rules, proposed rules and financial impact statements on the Secretary of State website. For questions about Administrative Rules email register@sos.arkansas.gov. Administrative Rules are filed by state agencies, boards, or commissions. Agency Rules “...interprets, or prescribes law or policy, or describes the organization, procedure, or practice of any agency…”. Administrative Rules do not concern the internal management of the agency, and are only filed by state agencies, boards or commissions. Administrative Rules are NOT filed by for-profit / non-profit businesses, property owners associations, or an entity not involved in state government.